Evolution of human colour vision over time: humans (homo sapiens) have developed a trichromatic view of the world in comparison to a majority of other mammals that only see the world from a dichromatic view. Early human ancestors are believed to have viewed the world using UV vision as far back as 90 million years ago. It is thought that the shift to trichromatic vision capabilities and the ability to see blue light have evolved as an adaptive trait over time. It is believed that due to a number of environmental factors, ancestral humans lived with limited colour vision. This is believed to have also been influenced by life styles, including being predominantly nocturnal. There is little data indicating the advantages of UV vision in early human ancestors. Early human ultraviolet vision, or ultraviolet sensitivity, included sensitivity in the wavelength ranges between 400 nm and 10 nm . These wavelengths are shorter than visible light but longer than X-rays. 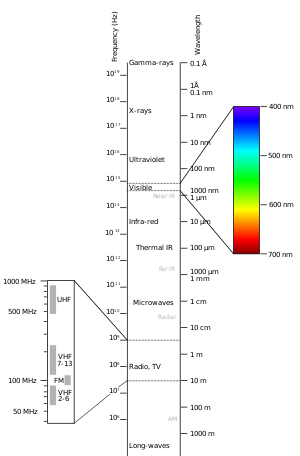 In some rare cases, some modern day humans can see within the UV spectrum at wavelengths close to 310 nm . In other animals that possess UV vision such as birds, ultraviolet sensitivity can be advantageous for courtship and reproductive success. This is because some birds have feathers with certain favourable colourations that can not be distinguished by human vision outside of the UV spectrum. Opsins function by acting as enzymes that are activated and change shape when light absorption causes chromophores to isomerize. Opsins are responsible for adjusting wavelength dependence of the chromophore light induced isomerization reaction. Therefore, opsins act by determining chromophore sensitivity to light at any given wavelength. Opsins that have different amino acid sequences but are bound to identical chromophores result in different absorption values at each wavelength. Opsin genes are used to encode the photoreceptor proteins responsible for color vision and dim light vision. The photoreceptor proteins created can be further categorized in to rhodopsins, which are found in rod photoreceptor cells and assist with night vision; and photopsins, or cone opsins, which are responsible for colour vision and expressed in cone photoreceptor cells of the retina. Cone opsins are categorized further by their absorption maxima λ max which is the wavelength when the greatest amount of light absorption takes place. Further categorization of cone opsins also depends on the specific amino acid sequences each of the opsins uses, which may have an evolutionary basis. Rhodopsins, also known as 'visual purple' receptor proteins, are encoded by Rh1, OPN2 and RHO genes. They are characterized by extreme sensitivity to light and enable monochromatic human vision in low light or dim conditions. They are broken down into retinal and opsin when exposed to these conditions. Humans have 3 types of photopsin proteins found in the cone cells. Long Wavelength Sensitive Opsin (Red cone opsin) – Encoded by the OPN1LW gene with a λmax of 560 nm that is found in the yellow-green electromagnetic spectrum despite its name. Its sensitivity to the colour red is still known to be higher than the other two human opsins. Middle Wavelength Sensitive Opsin (Green-sensitive opsin) – Encoded by the OPN1MW gene with a λmax of 530 nm found in the green region of the electromagnetic spectrum. Short Wavelength Sensitive Opsin (Blue opsin) – Encoded by the OPN1SW gene with a λmax of 430 nm found in the blue region of the electromagnetic spectrum. Certain parts of opsin genes and the vision of various species, including humans, has been known to change over time with different environmental changes. Recent studies have shown that primitive nocturnal mammalian ancestors had dichromatic vision consisting of UV–sensitive and red–sensitive traits. A change occurred approximately 30 million years ago where human ancestors evolved four classes of opsin genes, which enabled vision that included the full spectrum of visible light. UV–sensitivity is said to have been lost at this time. Mutagenesis experiments involving the Boreoeutherian ancestor to humans have shown that seven genetic mutations are linked to losing UV vision and gaining the blue light vision that most humans have today over the course of millions of years. These mutations: F46T, F49L, T52F, F86L, T93P, A114G and S118T, include 5040 potential pathways for the amino acid changes required to create genetic changes in the Short Wavelength Sensitive, or blue opsin. Of the 5040 pathways, 335 have been deemed as possible trajectories for the evolution of blue opsin. It has been discovered that each individual mutation has no effect on its own, and that only multiple changes combined following an epistatic pattern in a specific order resulted in changes in the evolutionary direction of blue vision. Incomplete trajectories, or evolutionary pathways, are shown to be caused by T52F mutations occurring first because T52F does not have a peak for the absorption of light within the entire visible region. T52F mutations are deemed to be structurally unstable, and the evolutionary path is immediately terminated. Having any of the other stable mutations occur first, including F46T, F49L, F86L, T93P, A114G or S118T, opens up the possibility of having 1032 out of 5042 potential trajectories open up to evolution. This is because having any of the other mutations occur first would allow for 134, 74, 252, 348, 102 and 122 potential pathways for mutations involving each of the remaining 6 mutants, equal to 1032 potential pathways for the evolution of short wavelength sensitive opsins to take place. Studies using in vitro assays have shown that epistatic evolution took place in Ancestral Boreoeutherian species with the 7 mutations on genetically reconstructed Boreoetherian short wavelength sensitive opsins. λmax values were shifted from a value of 357 nm to 411 nm , an increase which indicated that human short wavelength sensitive opsins did indeed evolve from Ancestral Boreoeutherian species using these 7 mutations. Further analysis has shown that 4008 out of the 5040 possible trajectories were terminated prematurely due to nonfunctional pigments that were dehydrated. Mutagenesis results also reveal that ancestral human short wavelength sensitive opsin remained UV-sensitive until about 80 million years ago before gradually increasing its λmax by 20 nm 75 million years ago and 20 nm 45 million years ago. It eventually reached the current λmax of 430 nm 30 million years ago. It is believed that middle and long wave sensitive pigments appeared after the final stages of short wavelength sensitive opsin pigments evolved, and that trichromatic vision was formed through interprotein epistasis. Scientists believe that the slow rate of evolution of human ancestral vision can also be attributed to slow environmental changes. It has been theorized that λ max-shifts might have been required as human ancestors started to switch from leading nocturnal lifestyles to more diurnal lifestyles. This caused their vision to adjust to various twilight settings over time. To identify the path from which short wavelength opsins evolved, increases in absolute max values were used by researchers with a limitation of approximately |Δλmax|<25 nm per step. This allows for subdivision of the 1032 potential pathways that were generated by analysis of first mutations beginning with any of the stable mutants: F46T, F49L, F86L, T93P, A114G or S118T to be narrowed down to 335 potential pathways. It was found that the last two mutations, F46T and T52F, occurred between 45 million and 30 million years ago as the absolute max for short wave length opsins was increasing from 400 nm to 430 nm . During this time, Ancestral Boreotherian had two long wave length opsins created by gene duplication, with one retaining the absolute max value of 560 nm , equal to the ancestral value. This led to the creation of the modern human long wavelength sensitive, or red opsin. The other short wavelength sensitive opsin increased its absolute max value to 530 nm and became the middle wavelength sensitive, or green-sensitive opsin. This occurred through mutations involving S180A, Y277F and T285A. The order that these mutations took place in the ancestral Boreotheria is currently not fully known. It is hypothesized that T285A was one of the first two mutations because absolute max values would be between 532-538 nm which is close to the absolute value found in human middle wavelength opsins. Normal human trichromats require a mixture of three primary colours for every day colour vision. Protanopes, deuteranopes and tritanopes are all dichromats, meaning they use a mixture of two primary colours to match any specific colour that they see. Thus, they are missing one of the three wavelength sensitive cones. Trichromats with all three cone pigments intact can generally see minimum wavelength differences between <1 nm and <3 nm for wavelengths that are found between 450 and 625 nm . Individuals with various forms of colour blindness such as deuteranopia and protanopia are missing human middle wavelength sensitive or long wavelength sensitive opsins. Their minimum wavelength differences are <5 nm but only at around 500 nm . Protanopes, who are missing long wavelength sensitive cones, are unable to distinguish between colours in the green-yellow-red section of the electromagnetic spectrum. They find yellow, red and orange colours to have much lower brightness when compared to a trichromat. The dimming of these colours can result in confusion in many cases, such as when attempting to identify red traffic lights, which appear to be clear. Other colour perception issues include having trouble distinguishing yellows from reds and violet, lavender and purple from blue. In other cases, objects that reflect both red and blue light may appear to just be blue to these individuals. Deuteranopes, who are missing medium wavelength sensitive cones, are similar to protanopes in that they cannot distinguish between colours in the green-yellow-red part of the electromagnetic spectrum. However, deuteranopes do not suffer from dimming issues. For example, purple colors are not seen as being opposite to other colours in the spectrum but instead appear to be similar. Tritanopes are missing the short wavelength sensitive opsins and see short wavelength colours in a green hue and dim compared to other colours. They may also see some short wavelength colours as black. Other perception problems include distinguishing yellow from pink or purple colours being perceived as shades of red. Researchers have found that trichromacy has advantages over dichromacy or anomalous trichromacy at further distances. This is believed to occur because visual cues such as shape decrease for colour vision as distance increases for targets of a smaller size. Using tests for spotting fruit pieces in bushes at distances of 1, 4, 8 and 12 metres, observations have shown that human trichromats tend to have advantages viewing fruits over dichromats and anomalous trichromats from distances at the 12 metre mark. From an evolutionary standpoint for the natural selection of trichromacy, this indicates that spotting fruit from long distances during visual search tasks was more advantageous than picking fruit at short distances, such as within arm's reach. The evolutionary process of switching from a single photopigment to two different pigments would have provided early ancestors with a sensitivity advantage in two ways. In one way, adding a new pigment would allow them to see a wider range of the electromagnetic spectrum. Secondly, new random connections would create wavelength opponency and the new wavelength opponent neurons would be much more sensitive than the non-wavelength opponent neurons.This is the result of some wavelength distributions favouring excitation instead of inhibition. Both excitation and inhibition would be features of a neural substrate during the formation of a second pigment. Overall, the advantage gained from increased sensitivity with wavelength opponency would open up opportunities for future exploitation by mutations and even further improvement. ^ a b c d e f g h i j k l Bowmaker 1998. ^ a b c d e f g h i j k l m n o p q r s t u v Yokoyama et al. 2014. ^ a b Terakita 2005. ^ Cheng & Novales Flamarique 2004. ^ a b Shichida & Matsuyama 2009. ^ Lamb, Collin & Pugh 2007. ^ Neitz & Neitz 2011. ^ Bompas, Kendall & Sumner 2013. ^ Gagin et al. 2014. Albrecht, M. (2010). "Color blindness". Nature Methods. 7 (10): 775. doi:10.1038/nmeth1010-775a. PMID 20885436. Bompas, A.; Kendall, G.; Sumner, P. (2013). "Spotting fruit versus picking fruit as the selective advantage of human colour vision". I-Perception. 4 (2): 84–94. doi:10.1068/i0564. PMC 3677335. PMID 23755352. Bowmaker, J. K. (1998). "Evolution of colour vision in vertebrates". Eye. 12 (3b): 541–547. doi:10.1038/eye.1998.143. PMID 9775215. Cheng, C. L.; Novales Flamarique, I. (2004). "Opsin expression: New mechanism for modulating colour vision". Nature. 428 (6980): 279. Bibcode:2004Natur.428..279C. doi:10.1038/428279a. PMID 15029185. Fernald, R. D. (2006). "Casting a Genetic Light on the Evolution of Eyes". Science. 313 (5795): 1914–1918. Bibcode:2006Sci...313.1914F. doi:10.1126/science.1127889. PMID 17008522. Gagin, G.; Bohon, K. S.; Butensky, A.; Gates, M. A.; Hu, J-Y. ; Lafer-Sousa, R.; Pulumo, R. L.; Qu, J.; Stoughton, C. M.; Swanbeck, S. N.; Conway, B. R. (2014). "Color-detection thresholds in rhesus macaque monkeys and humans". Journal of Vision. 14 (8): 12–26. doi:10.1167/14.8.12. PMC 4528409. PMID 25027164. Lamb, T. D.; Collin, S. P.; Pugh, E. N. (2007). "Evolution of the vertebrate eye: opsins, photoreceptors, retina and eye cup". Nature Reviews Neuroscience. 8 (12): 960–976. doi:10.1038/nrn2283. PMC 3143066. PMID 18026166. Neitz, J.; Neitz, M. (2011). "The genetics of normal and defective color vision". Vision Research. 51 (7): 633–651. doi:10.1016/j.visres.2010.12.002. PMC 3075382. PMID 21167193. Shichida, Y.; Matsuyama, T. (2009). "Evolution of opsins and phototransduction". Philosophical Transactions of the Royal Society B: Biological Sciences. 364 (1531): 2881–2895. doi:10.1098/rstb.2009.0051. PMC 2781858. PMID 19720651. Terakita, A. (2005). "The opsins". Genome Biology. 6 (3): 213. doi:10.1186/gb-2005-6-3-213. PMC 1088937. PMID 15774036. Tovée, M. J. (2008). An introduction to the visual system (2nd ed.). CUP. ISBN 978-0521709644. Wong, B. (2011). "Points of view: Color blindness". Nature Methods. 8 (6): 441. doi:10.1038/nmeth.1618. PMID 21774112. Yokoyama, S.; Xing, J.; Liu, Y.; Faggionato, D.; Altun, A.; Starmer, W. T. (2014). "Epistatic Adaptive Evolution of Human Color Vision". PLoS Genetics. 10 (12): e1004884. doi:10.1371/journal.pgen.1004884. PMC 4270479. PMID 25522367. This page was last edited on 10 January 2019, at 20:02 (UTC).